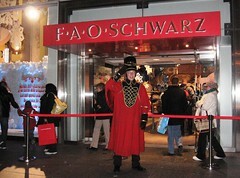 If you are in New York City for the first time, you have to take the kids to FAO Schwartz. It is an iconic location in New York City. The prices are alittle high for the toys, but the kids wil lenjoy seeing everyhthing they have. The workers who are dressd up at the main doors are very friendly andi nviting to all families. They have toys for all ages. I would recommned letting the kids pick out a small toy if you are on a budget. They will enjoy just being able to carry around a FAO Schwartz bag the rest of the day. they will remmeber the experienece. Not much for the adults, this place is all about the children, so let them enjoy t he trip to FAO Schwarz. Fabulous, iconic toy store packed with a wonderful assortment of unusual play things, from the old-fashioned to the hyper new. 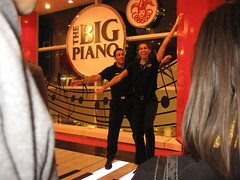 Definitely try out the giant floor piano from the movie "Big." This place really goes all out during the Christmas season.